My husband and I have been parents for eight whole weeks now and we've learned a lot about newborns. For one thing, we realize we've been undervaluing sleep our whole lives. It is actually the most precious thing in the world. We've also learned that spit up isn't the only bodily fluid that can be projectile, that a diaper bag without wipes is pretty useless, that babies often require more than one outfit per day, and we're even getting pretty good at getting stains out of shirts, pants, bags, couches and carpets. The biggest thing we've learned that once you think you have everything figured out, everything changes and you have to figure it out again. It's been a busy eight weeks of feeding, diapering and napping, but we've really enjoyed our time together as a new family. I haven't had as much time to cook as I normally do (imagine that) but I've tried a few new recipes that I'm going to share in the next few weeks. Now, for me to try a recipe when I hardly have time to shower means 1) that the recipe is really easy, 2) that the recipe sounds delicious, and 3) that we've run out of Fruity Pebbles. This one fit the bill so I took a chance and found a new favorite. It takes a while to cook but has very minimal hands-on time so it is very easy to throw together. Basically a whole chicken is steeped with garlic and ginger for few hours and then the broth you get from that is used to cook the rice that you serve with the chicken. Easy, huh? It really is, and I was surprised by how moist and flavorful the chicken and rice were. They both have a nice, subtle ginger and garlic flavor that are just wonderful on their own but are great with a little sesame oil and dipping sauce, too. This would be a great dish to make if you have a picky eater at your house like I do, or if you want a chicken dish that won't heat up your house by requiring you to turn on the oven, or if you just want an easy, delicious meal. Or if you just ran out of Fruity Pebbles. Bring a large pot of water to a boil and salt it. Add chicken to pot along with smashed garlic and sliced ginger. Bird should be completely submerged, but only just. Cover, reduce heat to medium, and cook for 10 minutes. Turn off heat and let bird remain in water for 45 minutes to an hour, covered, or until it is cooked through. Remove chicken from pot, reserve stock, and let bird cool to room temperature. Put half the peanut oil in a large skillet over medium heat; you may add trimmed chicken fat to this also. When oil is hot, add remaining garlic, along with shallots; cook, stirring occasionally, until lightly browned, about 5 minutes. Add rice and cook, stirring, until glossy. Add 4 cups reserved chicken stock and bring to a boil, then reduce heat to low and cover; cook for about 20 minutes, until rice has absorbed all liquid. Stir in salt and pepper to taste. Make a dipping sauce of remaining peanut oil, ginger, half the scallions and a large pinch of salt. Shred or chop chicken, discarding skin. 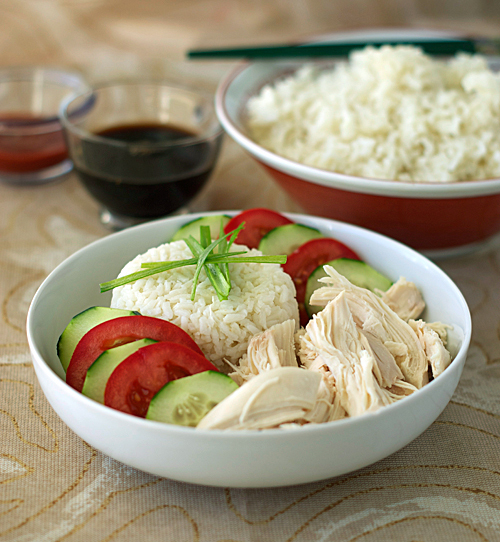 Put rice on a large platter and mound chicken on top of it; decorate platter with cucumbers, tomatoes and remaining scallions. 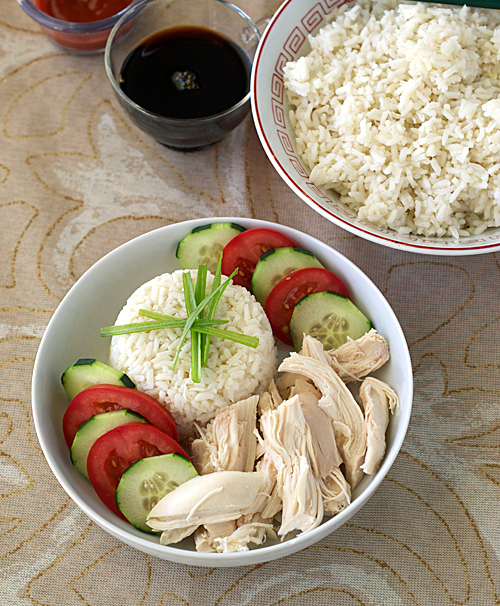 Sprinkle sesame oil over all and serve with dipping sauce. Glad things are going well with your little girl, and excited to see you here! I am cracking up about the Fruity Pebbles - I seriously cannot keep them in the house, way too dangerous :) This chicken sounds fantastic, and I am definitely always on the lookout for easy recipes! Never a dull moment with the way you are telling your story...Congratulations! Welcome to parenthood! Fulfilling it is, indeed...The sleep deprivation, you'll get used to that. Sleep? What sleep? LOL! This looks like a real homey dish. Rice? That is good, you need carbs, if to compensate for the lack of sleep. Or do you get more sleepy with more rice (note to self : better google that) Thanks for sharing. This looks yummy! Sleep is definitely something you take advantage of until you become a parent. It's a huge change - but all well worth it, as I'm sure you're realizing! :) This dish looks great. So good to hear from you, Nicole! Glad you and your family are doing well...and that you're still cooking! Such a gorgeous, simple dish, and I agree that it's perfect for summer when turning on the oven makes your entire house FEEL like an oven! Congrats on your new daughter. I am so happy for you. I am glad you are enjoying this wonderful time of life. :) Your picture looks so inviting. I love the colors. I look forward to trying it. It looks yummy ! :) Thank You for sharing. Your pictures are fantastic. This recipe looks delicious and I know you are a great parent. Your post is terrific. So happy you are back to blogging! I have missed you! This looks fabulous!